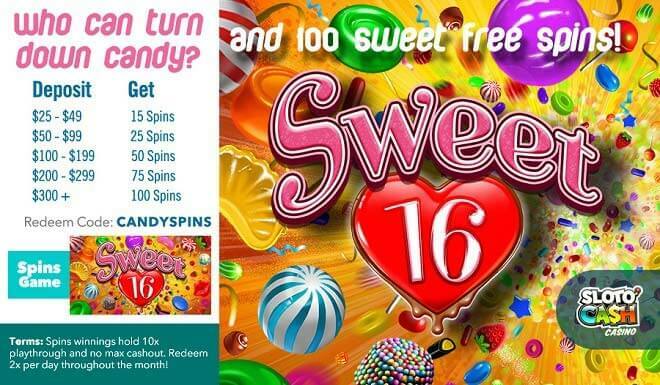 Free Candy, Free Spins and Free Cash this June! So, your candy addiction concerns your family and friends, who don't understand that you just can't quit anytime you want. But don't worry, this June you've got Mr. Sloto on your side! You don't have to prove anything to Mr. Sloto - all you need to do is spin the reels of the fabulous All Ways Pay, Sweet 16 slot and indulge in a world of 5 reels and plenty of Lollipops and winning chances! Your $25 deposits will take you to a sweet world of wins and Free Spins this June and beyond!